In the previous Blogpost, Barney Kiernan’s Pub, I noted comments from Anthony Burgess that a knowledge of the city is not necessarily the key to understanding the works of Joyce. He is also concerned about too much being made of the biographical information that influenced Joyce’s writings. In certain countries of the Far East, American films – even the most bizarre and fanciful – are taken for actuality, not fiction. Readers of Joyce in the West are sometimes no more sophisticated: they are more concerned with the biography of A Portrait than with the art, and they welcome Stephen Hero as a source of elucidation and gap-filling. This is desperately wrong. One of that things that is interesting in the writings of James Joyce is his interweaving of facts into his fiction and the joy one can have teasing out their effects. I have previously quoted the Love loves to love list from the Cyclops episode of Ulysses in the blogpost about M’intosh and speculating that he is Mr. Duffy from the Dubliners story, A Painful Case. In Stanislaus Joyce’s book My Brother’s Keeper, James Joyce’s Early Years, Stanislaus points out (page 54) that he is the model for Mr. Duffy. Our house was well down the lane and we had to run the gauntlet of the unwashed every evening coming home from school. In the end I had a fight with one of the most active of the cat-callers, a little red-headed rough-neck, who rejoiced in the sobriquet of Pisser Duffy. It was late in the afternoon, and the loungers from the cottages, and even the women, stood around without interfering. In the imaginary portrait for which I served as model. ‘A Painful Case’, my brother has given me the name of Duffy. Joyce loves lists and in the middle of the Love loves to love list, as well as the man in the brown mackintosh, Joyce notes Jumbo, the elephant, loves Alice, the elephant. This pachydermatous frolicsomeness so outraged his sense of propriety that after a last indignant letter he never wrote to her again, and she lost all trace of him. Knowing this section from Stanislaus’ book helps in understanding the passage in Ulysses and adds to the layers of meaning, which, though not remotely essential, leads to a richer understanding of the book. One of the benefits of running is that it gives one time to think and with the above in mind I decided to run to Dublin Zoo. 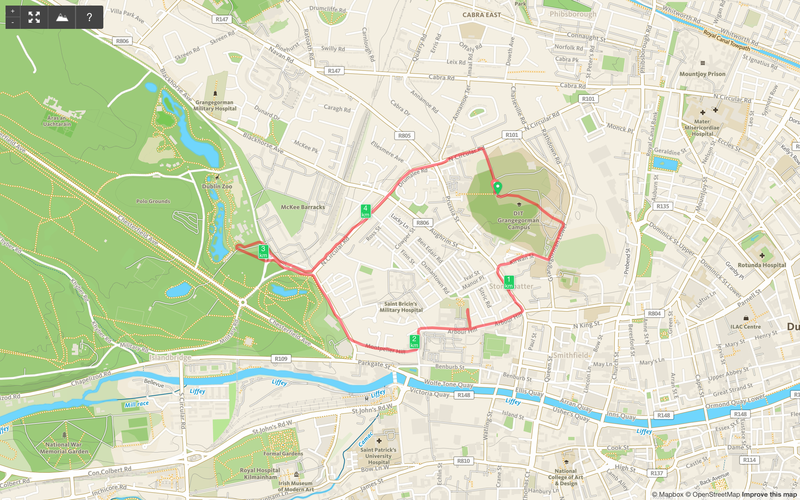 As the extract is from the Cyclops I decided to run via Arbour Hill, where the episode begins. *I was just passing the time of day with old Troy of the D. M. P. at the corner of Arbour hill there and be damned but a bloody sweep came along and he near drove his gear into my eye. I turned around to let him have the weight of my tongue when who should I see dodging along Stony Batter only Joe Hynes. —Lo, Joe, says I. How are you blowing? Did you see that bloody chimneysweep near shove my eye out with his brush? —Soot’s luck, says Joe. Who’s the old ballocks you were talking to? —Old Troy, says I, was in the force. I’m on two minds not to give that fellow in charge for obstructing the thoroughfare with his brooms and ladders. —Devil a much, says I. There’s a bloody big foxy thief beyond by the garrison church at the corner of Chicken lane—old Troy was just giving me a wrinkle about him—lifted any God’s quantity of tea and sugar to pay three bob a week said he had a farm in the county Down off a hop-of-my-thumb by the name of Moses Herzog over there near Heytesbury Street. It took me some time to figure out that Chicken Lane is now Arbour Place, and in this, one of the most accessible of the episodes in Ulysses the juxtaposition of the foxy thief at Chicken lane, is a tiny point of amusement in this wonderful episode. Burgess, A. (1968) Re Joyce. New York, United States: W. W. Norton & Co.
Joyce, S. (2003) My Brother’s Keeper: James Joyce’s Early Years. Edited by Richard Ellmann. Cambridge, Massachusetts, United States: Da Capo Press.